The UJ6300 is a great budget TV with a wide viewing angle, which allows it to accommodate any gaming setup. Its fast response time and low input lag of only 12.8 ms leaves little to no motion blur when watching television, or playing games. 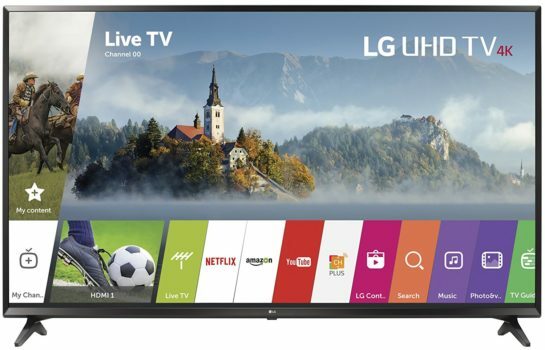 The picture quality of the UJ6300 is serviceable for a TV below $500 but doesn’t offer the deep blacks and saturated colors of mid-range TVs. Of course, the UJ6300 comes fully stocked with smart TV features such as streaming and web browsing, and a simple interface allowing for quick selections through menus and settings. The contrast ratio of this television is at its best when put in a well-lit room since the added light helps make the low contrast rate less noticeable. For the price and the extremely low input lag, this television is well worth it for gaming on a budget.